7.41 points at 29 votes (rank 230). 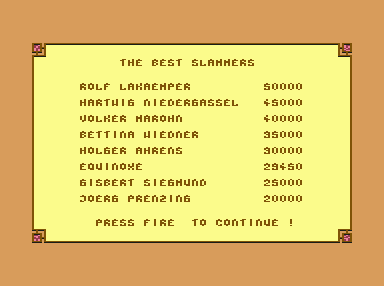 Grand Monster Slam, which was only available for home computers, seems to be heavily based on the arcade game Penguin Wars from 1985 which was made by the Japanse company UPL (Universal Entertainment Corporation). With this the war could have ended, but instead the Goblins took the stones, which they got back while receiving lots of bruises, to shoot back at the fort. With the same result as the first time... ...This went on for three years, until the tired parties could bring themselves to make a peace treaty. In memorance, they then met every 3 years for a big celebration, where honourable catapult shots were exchanged. If you have won all three duels of a league, you need to proove your accuracy by shooting the Beloms into the mouths of the six Faultons. These are not allowed any more in the regular game, as they had the silly habit to eat all Beloms instead of shooting them back. But don't worry, all swallowed Beloms are spitted out again after this intermezzo. At least this was secured by the Faultons. The graphics are painted and animated lovingly, the game fields are static. The sound is realistic during the rounds, the title melody gets you into the game. The opponents have different strenghts and weaknesses, to which you as player need to adapt to win the game. 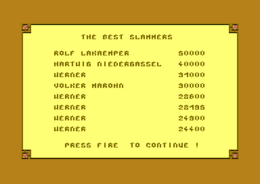 In the main menu you can choose the current "Hall of Fame" to look at the highscores. With "Faulton feeding" and "Revenge of the Beloms" you can train the intermediate games. 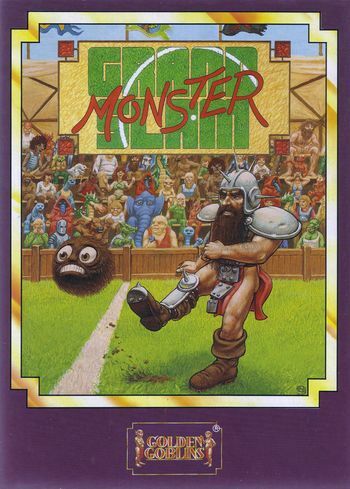 "Grand Monster Slam Main Tournament" starts the main game. 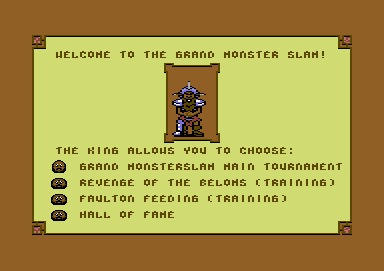 The cassette version of Grand Monster Slam is compared to the diskette version highly limited, as the opponents in the first two leagues are not chosen randomly - so you always get allocated the same three of the seven displayed opponents when repeating the game. The aim is to shoot all Beloms (furry ball creatures) to the opposing side. If the opponent or you are hit, this leads to a short unconsciousness, which lasts longer the more often you are hit. 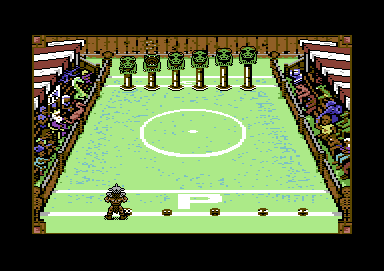 If you shoot into the audience, the opponent gets a Pelvant penalty kick: a member of this race ropes down at the field and the opponent decides the direction in which the Pelvant should walk towards you. If you decide for the right position, then the penalty kick will be repelled and the opponent gets a Belom back. If you are on the wrong position then you get three Beloms into your own half. The Belom which will attack next, shakes shortly before its attack, which gives you the chance to align the pole in the right position. Starting from the main position you can defend six attack directions. A changing of the position is only necessary for an attack from the side. The six Faultons are on pedestals of different heights and each need to be hit with one Belom. In the main game in the starting league you receive 2000, 4000 and 6000 points for the first, second and last victory. During the Revenge of the Beloms a number will be given by the king (10 after the first victory, then 20, 35, 45, ...). If you repell less, 100 points per Belom are subtracted. If you repell more, you get 100 bonus points per Belom. If you exactly fulfill the target, there are 5000 bonus points. How fast you can shoot depends mainly on the paths you take. If you have just avoided a Belom, this one is quickest to reach. If many Beloms wait on your side to occupy the Belom points, you should do a row shot: place yourself on a Belom point and press quickly the fire button in succession. The waiting Beloms occupy the Belom points, only to be sent directly to the opposing side. Exact aiming gives you time advantage. Either the opponent needs to dodge (therefore loses time and maybe lets himself be cornered) or he will be hit by the Belom (he stays down on the ground). The more often an enemy is hit, the longer he stays down. Use the time! If you can aim well and have the right timing, you should be able to hit the opponent once again when it gets up. If you can shoot exactly, you should try to hit the enemy at the height of the head. Those hits tire the enemy more than hits at the foot. Every enemy has difficulties to avoid flat shot Beloms which have bounced from the bank. Whenever you have the time, you should do the "annoyance gesture" (joystick downwards and fire). You might not notice it right away, but the enemy gets more and more nervous through this. When the enemy loses it's temper and shoots at the grand-stand, you reach a Pelvans. If you convert the Pelvans freekick, has 3 Beloms less at one go. That is already half the victory! It is recommended to keep moving all the time. Some enemies have difficulties to take the movements of the dwarf into account while aiming. A frequent changing of the direction can confuse the enemy. In the second and first league there is a disturbing fence in the middle of the field. As you need to aim higher, you will shoot slower. In the middle of the field the fence is interrupted. As long as the opponent lingers at the three middle Belom points, you can hit it without problem through the "hole in the fence". Only from the middle are effective row shots possible. Laziness: lazy opponents might not walk towards the Beloms that are too far away. Timidity: frightened opponents avoid approaching Beloms, as soon as they only come near them. Being occupied with avoiding, such opponents do often not get to shooting. Bad power of observation: some opponents seldom consider the movements of the dwarf when shooting. Shooting precision: some opponents have difficulties to hit the dwarf exactly. Speed: slow opponents wait longer at Belom points before they shoot the next Belom. Sensitivity: some opponents get up right away after a hit, while others stay down for a longer time. Brunf, the oger: Seldom avoids the Beloms (hits don't harm it either), lazy, gets annoyed easily, in a Pelvans it walks mostly left or right. Red Sonja Valmora, the amazone: quite frightened (hits also harm it a lot) and a bit slow. Conold, the barbar: not very precise in shooting, lazy. Zsch Lnk, the quadropus: bad power of observation, seldom gives way, a bit lazy. Klaus von Adlerberg, the knight: a bit frightened and lazy. Shoots often into the corners. Hiro Sha, the troll: not very precise in shooting, bad power of observation, lazy. Quirks, the gremlin: aims bad, but is quite fast and hard to hit. Gnarl, the gnoll: hits harm it relatively much. A bit frightened and lazy. All oppnents in this round are so strong that you cannot win against them quickly. You need to play them out, do net let yourself get hit and wait for the right occasion. Nurfuk, the yalk: It can shoot Beloms from all Belom points by magic (not only where it is standing). Always stay on the move! The yalk doesn't shoot very fast and is rather timid. Roarch, the dragon: It spews fire. So if possible do not stand dircetly opposite to it. By spewing fire it loses time, which you can use. By doing the "annoyance gesture" you can force the spewing at any time. After the spewing there is a pause, during which the dragon cannot spew any fire. Winner, the goblin: puts up a magic cyclone as an obstacle on the side of the dwarfs. Do not walk against the cyclone! Avoid being pushed into a corner by the cyclone! The goblin is (as all the goblins) a bit lazy. As beginner you should not confuse yourself, that you jump into all four positions with the dwarf. Only from two positions (e.g. : "dwarf looks to the left" and "dwarf looks upwards") you can get hold of all approaching Beloms. For each of the eight directions there is only one joystick movement that you need to learn. If you have the possibilityr, you should play with the keyboard, as the right/left movement is better to distinguish from the punching. Faulton number (from left)): 1. 2. 3. 4. 5. 6. FXXS: "An inventive "sports game" which needs tactics and skills. Due to the KO mode and the many loading times is the frustration potential very high. Therefore "only" good 8 points." Robotron2084: "Then, as now, there are only three adjectives that come to my mind when thinking about this game: fancy, monotonous and frustrating. Fascinated by the really convincing presentation of this game at the beginning, this changed more and more towards being bugged after playing for about a dozen times. Liveliness is missing in this game, the constant kicking seems more like working on an assembly line, the fun factor is deifnitely not high enough, this can't be helped by the mini games either. 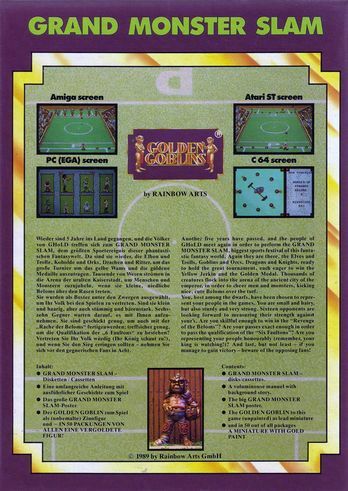 In one sentence: I didn't like this pseudo sports game with all its graphical and sound technical gibberish at all: 4 out of 10 points." TheRyk: "Concering what a pity, that there is no multiplayer mode: the game would then have been able to unfold a lot more potential. Exclusively sitting in front of the box during the long loading times and then finally just doing monotonous activities, will just get boring some time. Can be played occasionally, it is entertaining through the funny graphics and the successful sound, but unfortunately just for a limited short while. For me it is worth a tight 6 out of 10." In the sequel "M.U.D.S. - Mean Ugly Dirty Sports", you take over the role of a coach in a monster soccer team. 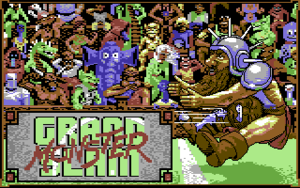 The programmer Teut Weidemann was involved in this project, unfortunately there is no C64 conversion of this humorous game. 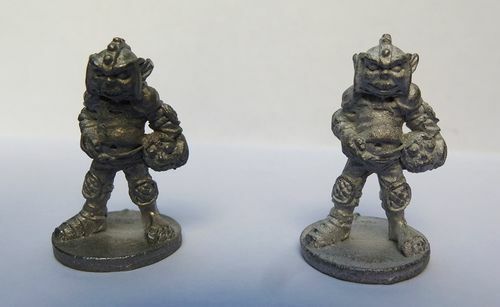 As a goodie there were two goblin tin soldiers in the box. This page was last modified on 26 June 2017, at 20:14. This page has been accessed 11,297 times.